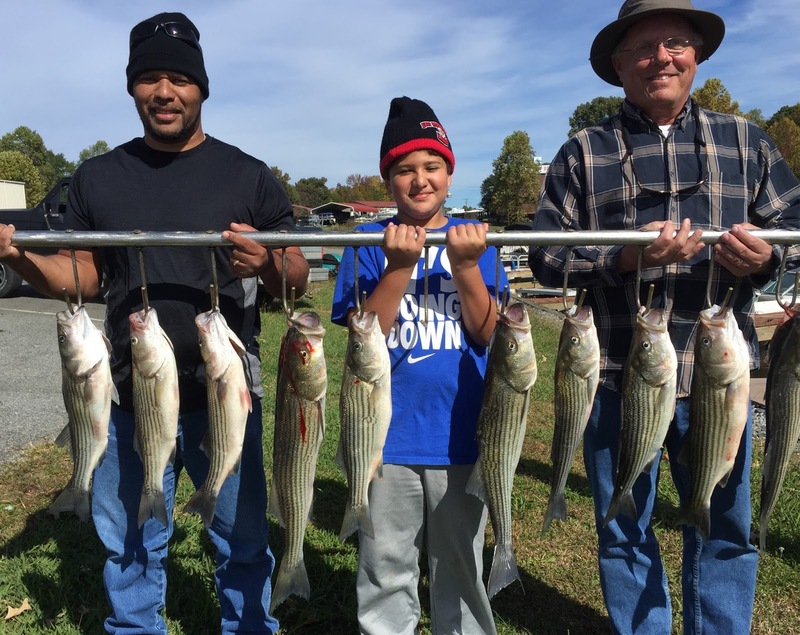 The leaves are turning, the weather is getting colder, the days are getting shorter and the fish are biting. Its fall. Nature is pretty predictable. Wish the Stripers were. Well they will be once the lake turns over which should be real soon. Until then Striper fishing can be a challenge. One day they are in ten feet of water and the next hugging the bottom in 25 feet of water. 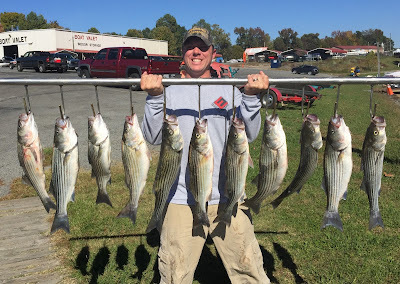 Today being cloudy I hoped they would be shallow so I pulled shallow flats nearby deeper water and found scattered Stripers. 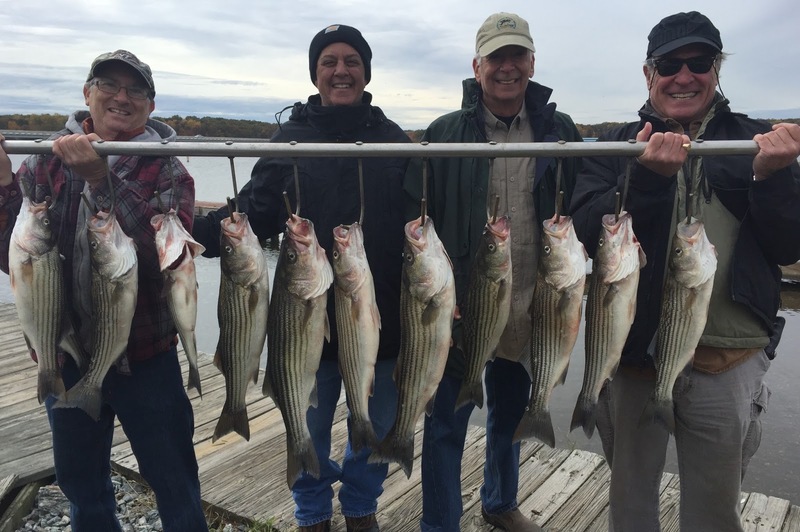 We fished the morning with planner boards and nailed the Stripers. Days like today are great for the jump fisherman who don't know how to read a depth finder. They can chase the Gulls around the lake and occasionally catch a fish or two. The next couple of days will be perfect for running and gunning. Today Jason had some friends out [who bailed out for the pic] for a morning of Striper fishing. It was a fun morning with sporadic action but we managed to catch some nice eating fish. We worked a combination of planner boards and downlines today but caught most of the fish nearby the channel. Yesterday and today the fish were not positioned where they should be for this time of year. Once the lake turns over they will become much more predictable. Need to be versatile this time of year to keep the rods bending. This is a screen shot I took today as we had numerous hookups. 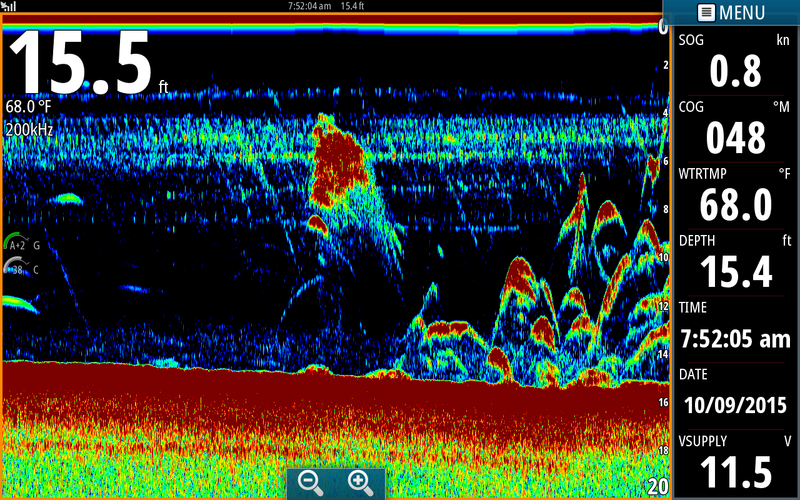 In the center of the screen is a ball of bait and to the right of the bait are Stripers going Nuts! I should have waited to take the pic but I was too busy netting fish when the good stuff was on the screen. 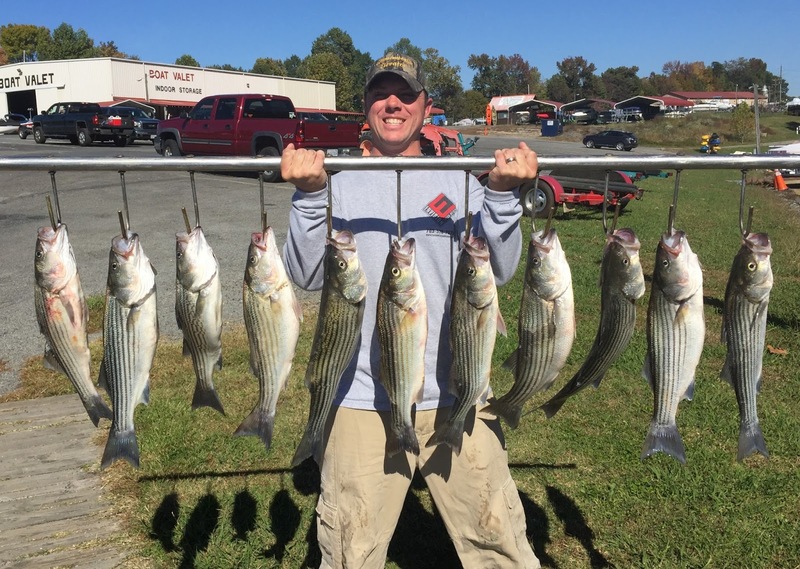 This shot is typical of feeding Stripers. 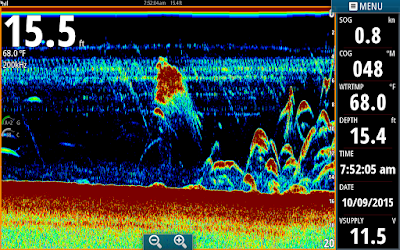 In the top half of the pic is bait fleeing from the Stripers. 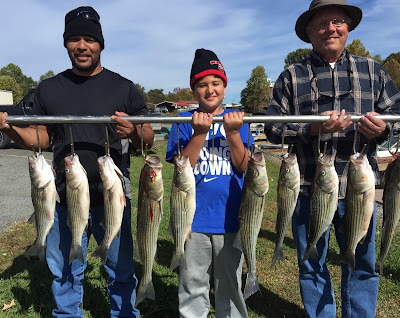 The Stripers are obvious just below the bait. The fish with the most color are in the cone of the transducer and you can see fainter arches and streaking without dark color which are on the outside of the cone. I was only in 20 feet of water here and the width of the cone where the fish are is not very wide. 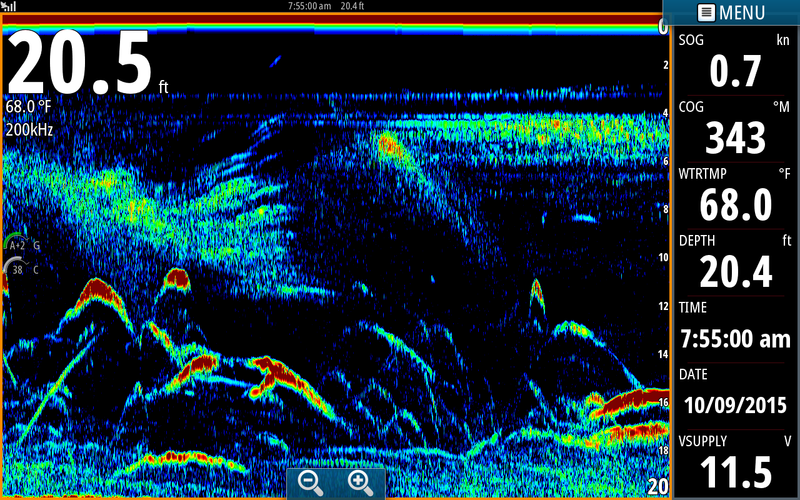 In the picture above this one the boat was only in 15 feet of water and all of the arches were directly under the transducer. There is a whole lot going on in these two screen shots. Love my Navionics! I got bored with all the bad weather lately so I put this together for you all to enjoy. Click on the picture for explanation of shot.